Controlling brake rotor temperatures is the easiest way to improve lap times, by allowing the brake pads and rotors to operate in their optimal temperature range, therefore increasing the frictional coefficient and decreasing stopping distances. Rotor and pad temperatures greatly affect the braking performance of the vehicle, too high of a temperature and too low of a temperature greatly reduce the frictional coefficient of the brake pad by operating outside of their recommended temperature ranges. Most race and semi-race compound pads require a temperature range of 600° to 1400° Farenheit, 300° to 800° Celsius. 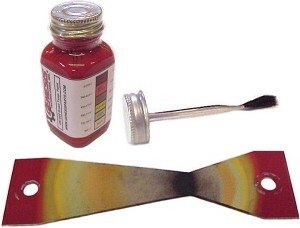 The Brake Temperature Paint delivers the widest temperature range in one bottle. Temperature readings ranging from 300° to 800°+ Celcius (600° to 1471° Fahrenheit) are displayed over a six color change from cold to hot. The bottle features a Metal Cap with a Horsehair Brush for quick and easy application on any surface, such as rear end housings, transmission cases, brake rotors or exhaust pipes. Packaged in a plastic carrying jar, the bottle also features brake temperature color code guide on the bottle for quick temperature reference.